Smile, Laugh and Learn: Spring has arrived! We spent the afternoon at the park. I have been wanting to make it in time before the tulips were all gone. It was hard to get Asher to stand still so most are actions shots. I was able to capture Jonas for a few quick shots, although he kept wanting to roll over. 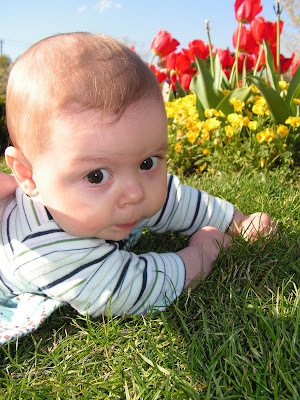 He was fascinated by the grass and kept trying to pick it up and put it in his mouth. Thankfully none made it in. This was the best shot I got of Asher looking at the camera. I kept trying to have him stand still and say "cheese" but to no avail. Thanks to my friend, Melanie, I was able to capture some good shots without too many shadows. She had given the advice to use your flash even when it's sunny out.